Sound "My first impression of the PRe2Ps sound was of its quietness. The line stage is as quiet as any Ive heard, but the phono stage is spectacularly silent. That means every sound emerges from the proverbial black background, which makes it easier to listen more deeply into the music." "The PRe2P's sound was very neutral, clean and transparent." "No one will ever confuse the PRe2P with a tube preamp -- it lacks the tonal lushness typical of tubes."
. There are six line-level inputs (one using XLRs) and a set of RCAs for the phono section, along with a grounding post." lets you control the PRe2P's channel balance, a feature not available on the front panel, and turn the display on and off. I found that the PRe2P sounded a bit better with the display turned off." "There is no on/off switch on the front or back; the unit is designed to be left on at all times." Value "If you seek a two-channel preamp, especially one with a killer phono stage, the Bel Canto PRe2P is an important one to check out. And if youre not into vinyl, there is the PRe2 line-stage-only version, which will save you considerable money." Ive been a devotee of tubed audio equipment for some time, but Im not a tube bigot. I really like to discover solid-state products that provide the same type of warm, harmonically rich and spacious sound that I get from tubed gear. Ive sampled a few solid-state preamps, but none has really persuaded me to forego my Audio Note M2 Phono Signature preamp, which I use with an Audio Note AN-S3 step-up transformer for analog playback. Bel Canto Design has a history of building superb-sounding audio components, both solid state and tubed. Therefore, I was eager to hear the company's latest two-channel preamp, the PRe2P, which includes a spiffy phono stage, an improved internal design based on Bel Canto's own PHONO1. The Bel Canto PRe2P ($4490 USD; the line-stage-only PRe2 costs $3490) is an elegant product that absolutely reeks of class; it is also totally devoid of any knob or lever. The front panel consists of a contoured silver faceplate, which frames a slim oval gray center section that has seven buttons and a display area. The display shows two lines of text in bright blue letters (which I can read from across the room!). The buttons, from left to right, are Mute (a 20dB reduction in volume or totally off), Enter (used for setting up the preamp), Main (selects the input to be used), Volume (two buttons that raise and lower the volume), Tape (selects the tape monitor), and Standby (turns off the outputs and the display). There is no on/off switch on the front or back; the unit is designed to be left on at all times. On the rear panel are both RCA and XLR input and output jacks; the XLRs, however, do not signal that the PRe2P is fully balanced design -- it is not. There are six line-level inputs (one using XLRs) and a set of RCAs for the phono section, along with a grounding post. All outputs are active -- that is, you dont have to switch between them. The very heavy-duty RCA jacks are spaced far enough apart so that you can use the thickest RCA connectors or locking-style RCAs without their rubbing against each other. An IEC power connector lets you experiment with the power cord of your choice, should you feel thats necessary (I do). The review unit didnt come with a power cord, so I used a Silver Circle Audio cord, which seemed to work the best of all the cords I had available. The PRe2P measures 17"W x 5"H x 14"D and weighs in at a very solid 26 pounds. A fully programmable learning remote is included with the PRe2P. Conceivably, it can control other devices besides the preamp (my vintage Meridian 508.24 CD player was not one of them, however). When you set up the remote, you will tell it to "add" the Bel Canto PRe6 preamp, which apparently has the same command set as the PRe2P. The remote also lets you control the PRe2P's channel balance, a feature not available on the front panel, and turn the display on and off. I found that the PRe2P sounded a bit better with the display turned off. With the PRe2P everything is programmable. Pressing the Enter button on the front panel or the remote (the instructions say you must press Enter on the remote seven times to display the menu, although I sometimes had to press it eight times) takes you to the setup menus. From there, you can select which inputs you will use, and then turn off the others. You can add an alphanumeric label to each input, so that when you select it, the source will be named in the front-panel display. Once you turn off the unused inputs, the active ones assign themselves to buttons on the remote. I have to confess that I initially found the setup menu on the PRe2P a little hard to understand. A call to Bel Canto provided knowledgeable assistance, but I suspect your dealer will be able to help you if you need it. A few examples in the instruction manual could provide more insight into the setup process. The volume control is quite special. It has a 100dB range in 0.5dB increments. If that doesnt match the level of one of your input devices, you can adjust the volume offset so the center of the volume adjustment range moves up or down, and the volume control will give you all the control over the sound level you will need. I found it necessary to adjust the offset for my phono section to compensate for a somewhat low-output cartridge. This feature also lets you adjust the level of each input, making level-matched direct comparisons easy. You can also set the phono stage gain, load resistance, and capacitance from the setup menu -- no need to open up the case and fiddle with dinky DIP switches. The phono gain can be set to either 40dB (for moving-magnet or equivalent cartridges) or 60dB (for moving-coils). Input resistive load can be set to a wide variety of values, starting at 30 ohms and going up to 47k ohms in small steps. Load capacitance can be set to 150pf or higher. You can even set the phono stage for mono operation, an advantage for monophonic playback. The phono stage is exceedingly quiet -- only 0.25mV noise! The PRe2P comes with some serious-looking feet. 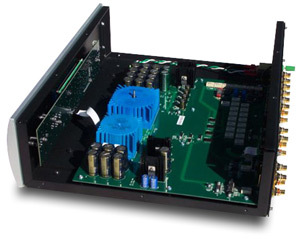 Many electronic manufacturers seem to pay scant attention to the feet on which their creations sit, resulting in the thriving industry in after-market resonance-control products. Because Bel Canto had paid attention, I elected to use the PRe2P at first without any after-market help. Later, I tried some HAL-O ball cup supports, but couldnt detect any improvement. A special compliment is due the folks at Bel Canto for being extremely friendly and helpful. I called a couple of times for information, and they were always pleasant to deal with. (I didnt identify myself as a reviewer at first.) Some manufacturers seem to resent users who have the temerity to call and ask for information, but not Bel Canto. Bravo. All components, in my experience, require a break-in period before their sound stabilizes and is ready for evaluation. The PRe2P was no exception; it took five weeks continuous with the power on, lots of music and the use of a break-in CD before the PRe2P's sound seemed to settle down, and Im not sure there werent minor changes still going on during the sixth week, when I began listening seriously. During the break-in period, the sound was all over the place -- sometimes good, sometimes not. If you audition a PRe2P, be sure its completely broken in. My first impression of the PRe2Ps sound was of its quietness. The line stage is as quiet as any Ive heard, but the phono stage is spectacularly silent. That means every sound emerges from the proverbial black background, which makes it easier to listen more deeply into the music. Its hard to describe this effect until you hear it; then it becomes obvious. The PRe2P has little sound of its own. No one will ever confuse the PRe2P with a tube preamp -- it lacks the tonal lushness typical of tubes. This may be a coloration of some sort, but it's sometimes an attractive one. The PRe2P didn't exhibit any of the unattractive attributes sometimes associated with solid-state equipment -- thin, etched sound; spatial vagueness; and lack of a well-fleshed-out tonal palette. The PRe2P's sound was very neutral, clean and transparent. Any coloration in the system had to originate elsewhere, and became the determining factor in the overall system sound. For example, the Art Audio PX 25 amp I prefer has a slight tendency to sound forward and bright. With the PRe2P, thats exactly how the system sounded. Switching to my Wright Sound Company WPA3.5 monoblocks, which have a more traditional SET tonal palette, I heard a more "listenable" presentation that I could (and did) enjoy at length. Having determined what residual colorations remained in my system, I experimented with a variety of interconnects to balance and offset them, and the PRe2P faithfully told me how each cable sounded. I settled on Blue Marble Audio interconnects with the Art Audio amp, and my usual Purist Audio Design Venustas interconnects with the Wright amps. I then proceeded to listen to some of my favorite evaluation tracks. The soundtrack to the movie The Last Starfighter begins with a stirring, somewhat bombastic piece -- lots of fanfares and deep bass drums -- but the theme transforms into a more lyrical statement towards the end, in preparation for transition to the next section. The bass drum was deep with lots of punch. Without sounding at all etched, there was plenty of detail, enabling me to hear a couple of questionable notes in the violin section. Orchestral chimes were realistic; I could hear the mallet strike each chime. The clarinet had a characteristically reedy sound, like a real clarinet. A newly discovered favorite is Keri-Lynn Wilson directing the Simón Bolivar Orchestra of Venezuela Danzón [Dorian Recordings xCD-90254]. Carlos Chavez's Chapultapec is a work constructed from three Latin American pieces. It begins with an adaptation of the Zacatecas March familiar to high school bands, which had lots of what Linn and Naim users call pace, rhythm, and timing -- PRAT. That means the piece moved forward with great momentum. Without good PRAT, tempi can seem flaccid, and music can lose the propulsiveness and spirit that makes you want to tap your foot, or even get up and dance (not a pretty thing to dwell on in my case). The PRe2P had PRAT in abundance; I never listened to any piece of music that didnt draw me in and make my head bob. Eva Cassidy's "Waly, Waly" from Wonderful World [Blix Street Records G2-10082] is a slow ballad that's recorded somewhat hot. Cassidys voice was sweet and smooth, with a touch of breathiness. It ranged from ethereal to powerful, as required by the interpretation. The PRe2P told me the flute, which I had initially thought to be an Irish whistle, was clearly a flute modulated like an Irish whistle. Cassidy's guitar was clear and incisive, reminding us that her musical accomplishments were not just vocal. The piano underpinned the mix with powerful low notes. The PRe2P accurately depicted the constant changes in tempi and microdynamics -- that constitute a performers interpretation of a piece, making "Waly, Waly" a moving experience. Eiji Oue and the Minnesota Orchestra Bolero! [Reference Recordings RR-92CD] Kabalevsky: Colas Breugnon  Overture is a real sonic spectacular, recorded by Keith Johnson. Unlike many recordings of a symphony orchestra at full cry, this one has the same sense of weight that I hear in the concert hall. The bass is very deep and dynamic, requiring a system with considerable bass capability to do it justice. My primary system doesnt have the most extended bass response, but in a secondary system, the sound was totally different. Here, bass was very extended and powerful. The Belles 150A Reference amplifier used here is particularly good at reproducing detailed, powerful bass, and the Usher CP-6381 speakers are becoming benchmarks for their ability to produce dynamic, deep bass from fairly small cone drivers (8" in their case). Through this system, and with the PRe2P, the deep-bass content in Colas Breugnon  Overture was magnificent. On the other end of the spectrum, the highs were extended and detailed without sounding steely. The same cut has extensive, energetic highs that can sound somewhat hot on a system that isnt smooth, but the PRe2P was as smooth as silk. Midrange detail was plentiful, with realistic orchestral timbre and dynamics. The soundstage was spacious, but not unnaturally pinpoint. Thats the way I hear a soundstage when at a concert, so I give the PRe2P high marks. My absolute favorite test cut is from Jordi Savall and associates, La Folia 1490-1701 [AliaVox AV 9805]. "Folia: Rodrigo Martinez," has an incredible density of musical information. The PRe2Ps highs were balanced just right, and well integrated into the soundfield. The midrange was smooth and musical. For me, what gives this piece the vitality and verve that make it possible to listen enthralled over long periods are the constantly changing dynamics and tempi. If a system doesnt get those just right, the piece tends to collapse in a jumble of notes that obscures the music. At first, I thought the PRe2P was compressing microdynamics somewhat. I refer here to the slight changes in level that occur throughout a musical performance. They often are not written into the score, but they are a fundamental means for artists to phrase music to express themselves. After I inserted some Blue Marble Audio interconnects, microdynamics improved, and I reacted to the piece as I normally do: with lots of head-bobbing and toe-tapping -- indications that Im fully caught up in the music. It was easy to follow the melodic line of each instrument, and the tambourine, which lays out a filigree of notes in the background, became easy to distinguish. Whoever devised the PRe2Ps almost infinitely adjustable remote phono-impedance loading surely knows how to torment a vinyl fanatic. Imagine being able to sit in your listening chair and change the load resistance and capacitance with the remote control, in exceedingly fine steps. Think of all the time the poor vinyl fanatic will spend wrestling with a decision on whether the cartridge sounds better with 31- or 32-ohm loading. Im sure more terminally afflicted vinylholics will settle on a different loading for each LP. I went through a more abbreviated round of experimentation, and found that I couldnt tell the difference between really close settings, but finally settled on a 77-ohm setting for my Dynavector DRT-XV1 cartridge. Of course, all that fooling around would be pointless if the PRe2Ps phono section wasnt decent-sounding. Actually, it was sensational. The PRe2Ps phono section was the quietest Ive heard by a significant margin. No longer did I have to listen around any subliminal noise floor, except that coming from the vinyl itself. I listened to Eva Cassidy's Songbird [S and P Records S&P-501] and was captivated (again) at the coherence of the sound. It seemed less granular than the same performance on CD. Highs were smoother and less mechanical-sounding. Bass was powerful where appropriate, and instruments were realistic in size and tonal balance. I tried to listen to a single cut -- "Autumn Leaves," on which Cassidy gives a benchmark performance -- but I failed. I listened to the whole LP. Perhaps thats the major failing of the PRe2P preamp: it figuratively disables the cueing lever on your turntable, preventing you from removing the LP from the turntable unless the stylus is in the lead-out groove. The same LP on my Audio Note combination is similarly beguiling, but perhaps a little less smooth on top, and slightly less quiet. Both preamps do full justice to the musical content of this LP. I cued up Classic Records reissue of Simon and Garfunkels Bridge Over Troubled Water [Classic Records KCS-9914]. I intended to listen to a couple of cuts, but I listened to the entire LP -- twice. Finally, I managed to focus on the title track. The PRe2P penetrated the dense mix toward the end of the LP more clearly than my Audio Note combo, which sounded more distorted. I think some of the distortion is on the record, but I seemed to hear more detail with the PRe2P. It also told me unambiguously when the stylus of the cartridge was cold and needed to play awhile to limber it up. I next cued up my recently acquired Fritz Reiner and the Chicago Symphony Orchestra Spain [Classic Records LSC-2230-45], specifically Albéniz's Iberia: Fête Dieu À Seville. This is not my favorite piece on the recording, but is a good test of an LP playback system. It's very complex, with huge orchestral climaxes that are hard to sort out. The PRe2P exhibited realistic tonality and good spatial location of instruments. Dynamics were appropriately huge without distortion -- not easy to do. Some of the orchestral climaxes sounded a bit strained, which I attributed to the recording. My Audio Note combination was less successful in reproducing the LP, jumbling the orchestral climaxes a bit. Its not that everything wasnt audible; it just didnt come together as coherently. My primary comparison was with my Audio Note M2 Phono Signature preamp ($4000) and Audio Note AN-S3 step-up transformer ($3500), which have no remote control. The sound of the Audio Note Phono M2 Signature is classic tube: spacious, harmonically dense, timbrally realistic, and replete with both macro- and microdynamic prowess. Its fairly quiet for a tube preamp, although the phono section can produce some noise if good tubes arent used. (I currently have new, but broken in, Groove Tube 12AX7-M Mullard replicas in the phono section, along with cryoed EI Gold Elite 12AU7s in the line stage.) Although bass is quite tuneful, Ive heard several units (some of which used tubes) with slightly deeper bass extension. The Audio Note has full, tuneful bass, with good weight and definition. The PRe2P certainly had plenty of bass, and its high frequencies went out forever. There was no comparison in the noise area; the PRe2P is state of the art in that respect. The Audio Note has a more laid-back high end, which makes it more compatible with the voicing of my system. Its quiet for a tube preamp, even the phono stage. But it depends on the Audio Note AN-S3 step-up transformer to boost the output from a moving-coil cartridge to a level where the moving-magnet phono stage can handle it. The AN-S3 contains two silver transformers that provide lots of gain, easily enough for my 0.3mV-output Dynavector cartridge. But there are only two setting for the input impedance, and the low setting sounds terrible, even with Audio Note cartridges. Playing "Folia: Rodrigo Martinez" through the Audio Note M2 Phono Signature, I noted that the strike and decay of the opening bells were very well defined. The bass drum showed lots of weightiness, and went as deep as with the PRe2P. Instrumental tonality was dense and accurate. The constantly swirling, changing volume and tempi came through with exquisite clarity. The notes cascaded energetically into space, giving the impression that the musicians were having a blast playing this piece. Certainly Jordi Savall was -- his impromptu vocal accompaniment could be heard at times. The Audio Note seemed to handle the momentum and dynamic swings of this piece effortlessly, while the PRe2P, in direct comparison, seemed to be working harder at it. The Bel Canto PRe2P is a remarkably transparent preamp. It is incredibly quiet, affording the listener abundant real detail. The PRe2P is also tonally neutral, its macrodynamics are excellent, and its sound is harmonically accurate. The phono stage is as good as any I have heard, easily bettering my Audio Note AN-S3/M2 Phono Signature combination. Its controls provide exceptional ease of use for the listener. If I try my reviewers best to find something to carp about, it would be in terms of microdynamics, which seemed a bit more effortless with my Audio Note M2 Phono Signature. However, without the side-by-side comparison, the PRe2P sounded just fine in this regard. I thoroughly enjoyed my time with the PRe2P in my system, especially when playing vinyl. If you seek a two-channel preamp, especially one with a killer phono stage, the Bel Canto PRe2P is an important one to check out. And if youre not into vinyl, there is the PRe2 line-stage-only version, which will save you considerable money.